Ken says he's pretty sure no other show makes up as many new words. David talks about how these three part episodes are done in the same vein as The Simpsons Halloween Treehouse of Terror episodes. He then says they are very complicated to pull off because they get ambitious and try to pull off three different stories and then the script turns out to be an hour long. They admire the many Benders. John says his Bender belches have cleared out studio rooms. The Bender segment of the episode was written by Eric Rogers, who couldn't be there that night. Apparently there was a removed reference to the movie, The Iron Giant. David says the inclusion of a giant robot still counts. John asks how they were able to pull off having the band Hanson and their hit song, Mmmbop, in the episode. David says they "paid Hanson some money...and then killed them". Ken says at one time electricity was going to make Bender grow bigger. Ken says a fan pointed out that Zoidberg had the emotional range of a five year old. John did standup at the Apollo Theater. John points out another real belch from Bender. Ken says they had to cut out all the parts that made sense. Ken Keeler wrote the second segment of the episode. David says one issue with these segments is trying to make the plots fantasy-related when the show is already fantastical in nature, so it's more about changing the characters than the "rules" of the universe. David says Frank Welker did the man-eating anteater sounds, and was the original Freddy from Scooby-Doo. David says that only in a unique episode like this can they reduce the Professor to a skeleton. 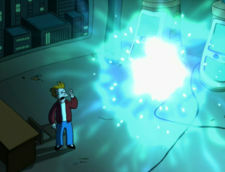 Billy notes that in this episode people are able to talk long after they should be dead. David points out two new words, "murderology" and "murderonomy". Ken asserts that the term for this is a neologism. David is skeptical. Billy has a story about putting soup in the microwave. Ken says he shamelessly reuses his idea of Bender turning into a car in different episodes. David loves that they created an "accusing parlor" just for this episode. Ken says the script called for Nibbler to be "skewered like a tomato" between Scruffy and Cubert. They talk about how upsetting it is to see Zoidberg all chopped up. Billy likes it when Leela gets angry and nasty. David put his parents' home address as I. C. Wiener's. "Is that why they moved?" David says that they recorded Stephen Hawking's lines from Hawking himself. Matt talks about how they visited Al Gore's house to record his lines. Al Gore waved to Matt and David from the porch. They mention that Gary Gygax and Nichelle Nichols recorded their lines themselves, and that Nichelle is an official friend of the show. They joke that they could not get Deep Blue. They talk about Gary's influence on the show and their own experience playing Dungeons and Dragons. Billy says he's so quiet because he's watching the episode, amazed that he can hear the real Al Gore and Nichelle Nichols talking. David tells the others how bizarre it felt to watch the Vice President physically act out his lines, specifically doing his screaming line and throwing himself on his couch. David says Nichelle Nichols really enjoyed saying her line about Star Trek conventions and an eternity of nerds. Billy West: I know how [Bender's death by microwave] it works. Once, when they were invented, I took a can of Campbell's soup and put it inside...and I saw the Apocalypse. It was sparks and everything. David X. Cohen: It really is Professor Stephen Hawking. We recorded, uh, him at CalTech, where he, uh, lectures sometimes. He seemed to have a very good sense of humor, by the way. He's, uh, appeared on this show and The Simpsons, which shows good taste. David X. Cohen: Also, he knows a little bit about physics. This page was last edited on 25 August 2016, at 07:38.